American styled pancakes. They’re fluffy, they’re creamy and they’re extremely mouth watering, but they’re also full of sugar and CARB’s, right? Wrong! Well, in this instance anyway! 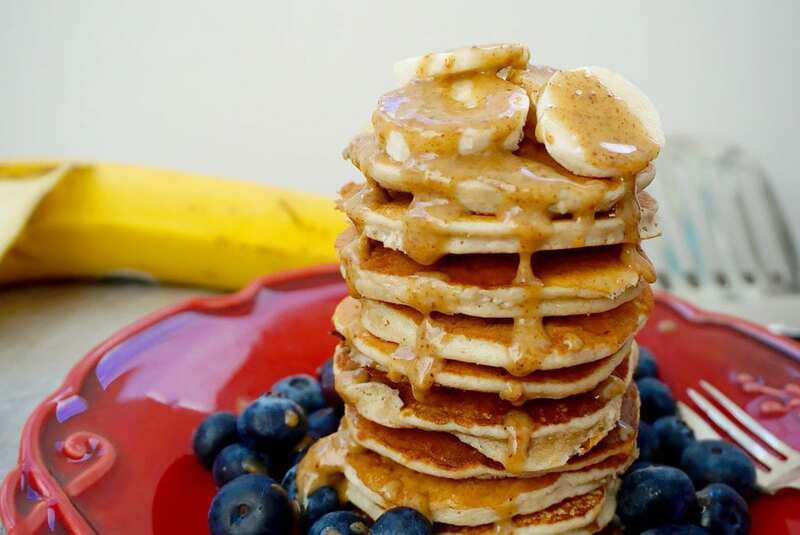 These creamy banana and almond protein pancakes are not only low in CARBS, but they’re also high in protein – making them the perfect post workout breakfast meal, too! Protein is an essential part of our diet. However, many of us, without knowing it, don’t consume enough of it. Protein is an essential component to almost every cell in our body and our body uses it to help repair and rebuild muscle tissue. On top of that, the body also uses protein to make enzymes, hormones (essential for ladies who may experience hormonal issues), and to build our bones, muscles, skin tissues and blood. Protein is also referred to as a ‘macronutrient’ alongside fat and carbohydrates. This means that the body relies on a large percentage of it to function well. However, unlike fat and carbohydrates, the body does not store protein and therefore, if you don’t have enough in your system then your body won’t have anywhere to go to when it needs a new supply and the little protein that you do have, your body will use this purely for energy instead of growing muscle, etc. So what is whey? It is a by-product of cheese making. Cow’s milk is made up of a lot of water, a tiny bit of fat and sugar (lactose) and a healthy amount of protein. That protein breaks down into 80% casein and 20% whey. Whey combines all nine essential amino acids, making it one of the most nutritional forms of protein we can consume. One of these amino acids is called leucine, which is particularly good to help build muscles. An average serving of whey powder delivers a similar amount of leucine as eating 10 eggs! In fact, we have our very own Primal natural whey protein! Check it out here. Now, I hate to brag but when it comes to these pancakes, I have to say that they taste just like the real thing! They’re creamy (thanks to the whey), they’re extremely fluffy and they’re just the right sweetness too – thanks to the natural sugar of the banana. On top of that, they’re low carb, full of healthy fats (thanks to the almond flour) and they contain only 4 main ingredients – almond flour, whey, 1 banana, and 2 eggs. That’s it! So if that’s not an easy morning breakfast idea that’s fun for all the family then I don’t know what is. 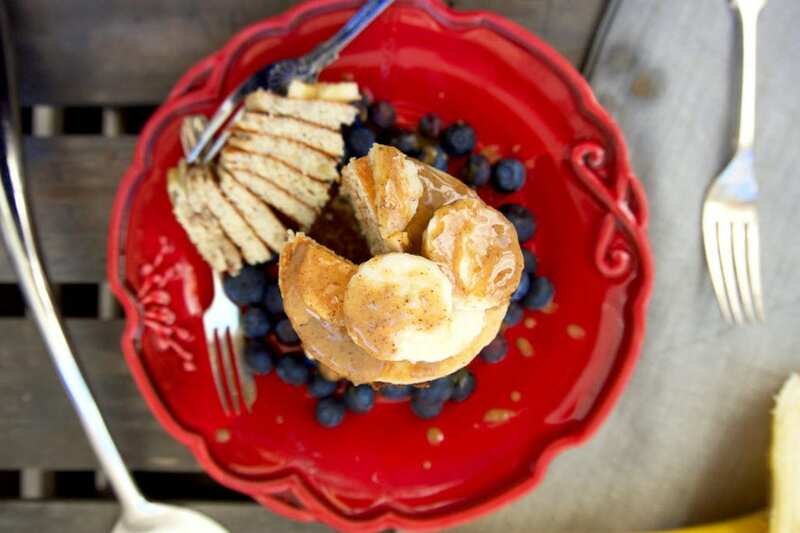 We topped ours with a few extra banana coins, fresh blueberries and a little almond butter (great for the kids). Healthy, but it sure doesn’t taste like it! 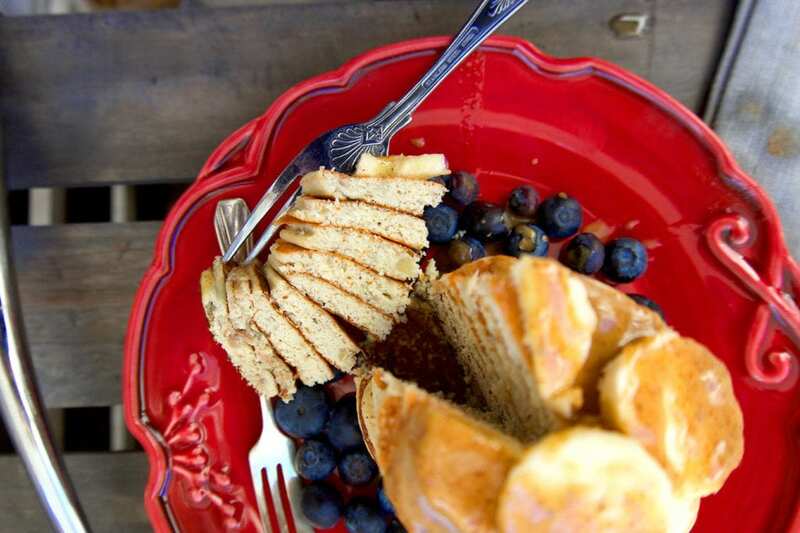 A delicious primal and paleo friendly protein pancake recipe for one. Simply double the recipe for two servings! In a bowl whisk together your eggs until foamy. Add the sliced banana and mix the egg and banana together until you have almost no banana lumps. Add the almond flour and whey protein powder and whisk everything together once again. If you're using a vanilla pod then add this too. Heat a frying pan with a tsp of coconut oil and make sure that the entire pan is well greased with a tissue. Using a tbsp, add a dollop of pancake mixture to the pan and cook on medium heat until bubbles start to appear and then quickly flip. Cook for another minute or two on the other side and then repeat this process until you’ve used up all your pancake mixture. I keep my pancakes in the oven on a warm plate whilst cooking the rest of my pancakes. 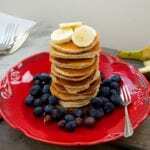 Once done, stack your pancakes high and top with banana, blueberries and a tsp of almond butter - if you fancy! At the moment we do not sell our own WHEY powder, however, this is something we are currently working on. In regards to the almond flour, you can find this in most supermarket stores down the baking aisle. You can also use ground almonds. For sugar alternatives, we recommend stevia, coconut sugar or raw organic honey. You’ll also find cacao powder at your local supermarket. If not, Amazon is a great place to buy from! do you sell the whey powder and if not why not. where do i get almond flour please. other suggestions are for things i cant find such as suger alternative Kia is it? other types of flour and the cocoa powder that you recommend, i just cant find.